This chandelier looks great. It takes a long time to assemble but most crystal chandeliers do. It looks much more expensive than it was. 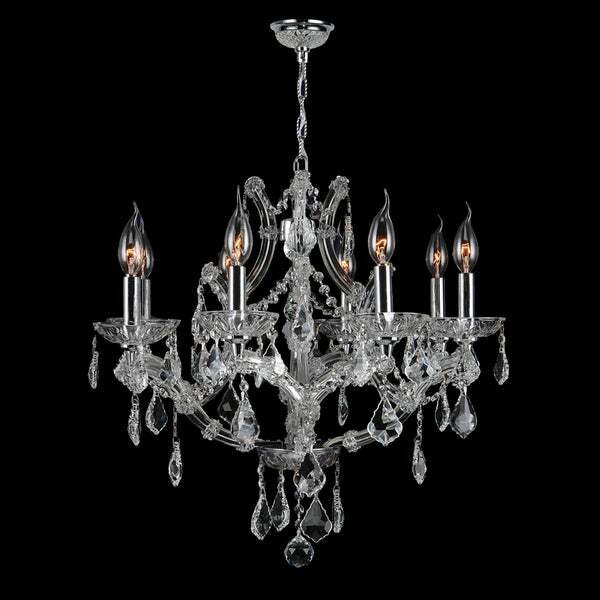 Maria Theresa 8 Light Chrome Finish and Clear Crystal Glam Chandelier Medium 22" x 22"
This stunning 8-light Crystal Chandelier only uses the best quality material and workmanship ensuring a beautiful heirloom quality piece. Featuring a radiant chrome finish and finely cut premium grade clear colored crystals with a lead content of 30-percent, this elegant chandelier will give any room sparkle and glamour. Assembly Required. This product will ship to you in multiple boxes. This fixture does need to be hard wired. Professional installation is recommended. Warning: Attention California residents: This product may contain lead, a chemical known to the State of California to cause cancer and birth defects or other reproductive harm. Please note: Orders of 151 pounds or more will be shipped via Freight carrier and our Oversized Item Delivery/Return policy will apply. Please click here for more information. This fixture needs to be hardwired. Professional installation is recommended. Dimensions 26.0 In. X 26.0 In. X 22.0 In. After finally deciding on this beautiful chandelier and placing the order I was anxiously awaiting its arrival for my master bath renovation. 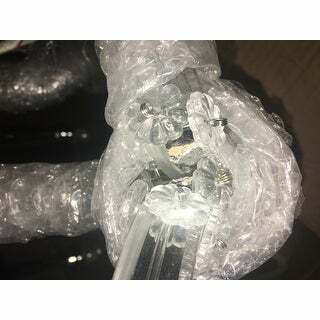 Unfortunately the box arrived damaged and one arm of the chandelier was cracked. I am so disappointed because it is a lovely chandelier and would have been perfect in the space. My husband does not want to risk this happening again during shipping because of this experience. As you cross the threshold and flick the switch, does your home's lighting style fall flat? Don't worry. There's a light in the dark. From the homey glow of a rustic chandelier to the sleek suspension of modern pendants, you can find stylish lighting fixtures for a purposeful reflection of your story. Here's how to recreate popular lighting styles for a gorgeously lit home that deserves to be seen. Everyone knows the tried-and-true dome light. If you've glanced up and felt your generic fixtures could be just a little bit more personal or exciting, you're right. But you don't have to add a big, flashy fixture that makes guests double-take when you give them a home tour. You just need to find that one handsome addition to make your home look more put together. Here are all the types of lighting fixtures that can brighten your days. The right lighting makes all the difference in a modern home, but choosing bulbs and fixtures that provide the perfect level of illumination while matching each room’s look and decor can be easier said than done. Check out these tips before you buy to make sure you get everything you want out of your new home lighting. Lighting is the most important feature when you're trying to create ambiance. If your guest room is looking dark and dingy or your bathroom is overly harsh, you'll run off all your guests. To bathe every room with natural-looking light, you’re going to need at least one general fixture and one small accent. This inspirational guide is full of home lighting ideas to find the right style and fixture for each room. Life happens in the kitchen. As you and your spouse unwind at the counter with a bottle of wine or your kids whip up a Mother's Day breakfast, you’ll need the perfect lighting to match every moment. In this guide, learn how to find stylish and functional kitchen lighting that ages as well as you do. A chandeliers is the perfect overhead lighting option. These tips will tell you how high to hang a chandelier for beautiful lighting in any room.